This elliptical stone circle hides beneath a canopy of trees in dappled shade right next to the main A35 road. As you stand here cars go rushing by oblivious to the wonder just metres away from them. The tree cover and confined space that the stones occupy make photographing the site difficult but it has a peace and tranquility despite the passing traffic. 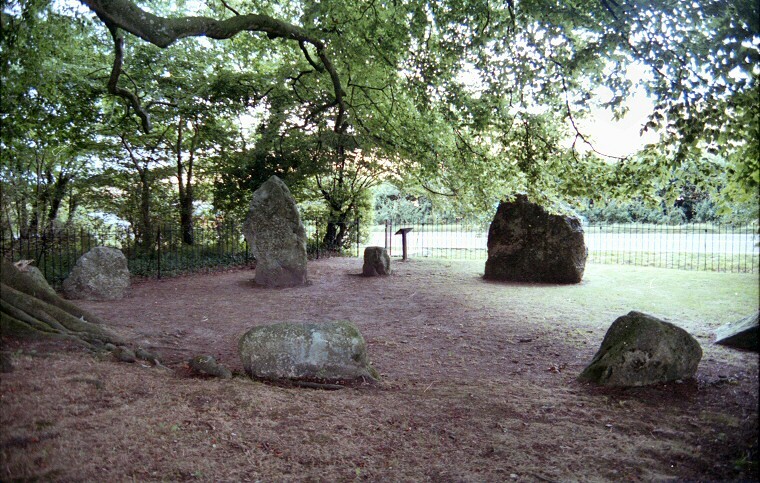 Winterbourne Abbas is only a small circle - it measures around 9 metres by 7.8 metres and consists of seven stones that measure less than a metre in height, with an entrance at the northwest flanked by two much larger stones. One is a thin pillar that stands over 2 metres high whist the other entrance stone is a square block around 1.8 metres high (The two large stones in the top centre of the top photograph). 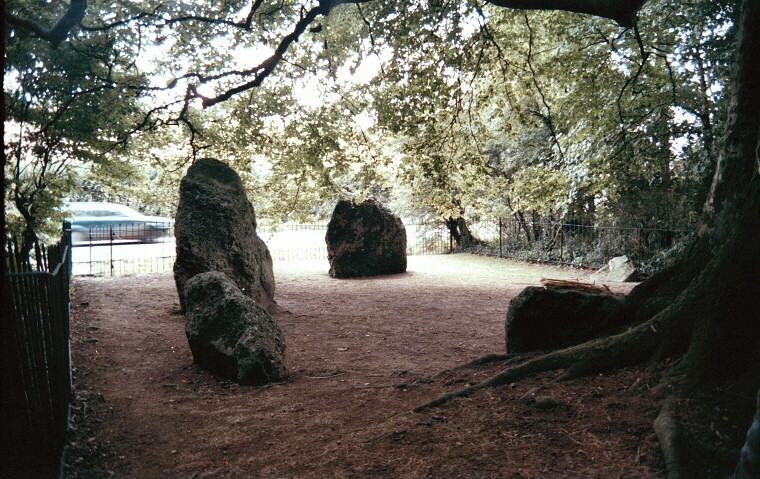 The two smallest stones in the circle lie opposite this entrance. The 17th century antiquarian John Aubrey described another circle about half a mile to the west but this has since been destroyed, although a fallen 2 metre stone known as the Broad Stone lies semi-buried beside the road about a mile to the west. The branches of the large tree to the right of the picture used to overhang the circle but much of the tree was cut down in 2007 due to disease leaving only the lower section of the trunk. Much of the vegetation beyond the railing has also been removed and the circle now has a very different 'open air' atmosphere to that show in these pictures.